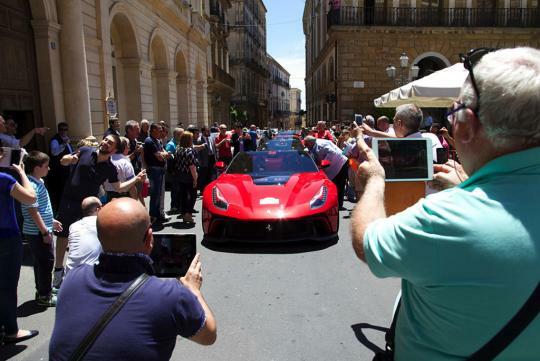 A bespoke one-off F12 showed up at the recent Ferrari Cavalcade held in Sicily. The F12 TRS is essentially a barchetta variant based on the F12berlinetta, created by the Special Project Division of the prancing horse automaker. The two-seater roadster sports a wraparound windscreen, with the sheet metal on the bonnet now incorporating a glass window to showcase the engine's red cylinder heads - a tribute to the 250 Testa Rossa which the car draws inspiration from. Although the cabin is filled with exotic cow hide, Alcantara and carbon fibre, it ditches several creature comforts, such as the glove box, air vents, carpets and audio system. Powered by the conventional petrol-driven 6.3-litre V12 found in the coupe, the TRS's 730bhp is good enough to see to a century sprint timing of just 3.1 seconds. Whoever ordered this bespoke F12 from Ferrari must have some serious power. 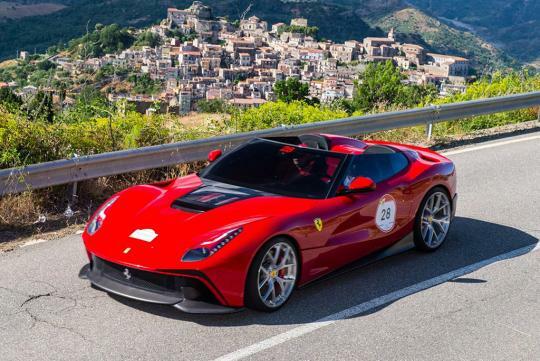 The Italian supercar made this F12 TRS specifically for a buyer who requested an "extreme, two-seater, open-top sports barchetta." Performance-wise, you're looking at the same engine as the F12berlinetta. The difference is all in the design. A modified aerobridge runs all the way to the back on the 'Rarris sides to create maximum downforce. It also sports a dark band of glass for the wraparound windscreen. Inside the F12's been stripped of everything but the bare essentials, meaning no glovebox, central air vents, stereo system, or even floor mats.